Seeker of Hope / Brawler of Friendship Trial Decks now available! Use the powerful Legion ability in these brand new Trial Decks! Pick up one - or both - of these Narukami and Royal Paladin decks today! The newest Bermuda set arrives! With every card having both a White and Black version, you can customize the look of your deck more than ever! A perfect set for those looking for an easy and powerful entry into Vanguard! Pick some up today! Set 15: Infinite Rebirth now available! Infinite Rebirth roars into the game with brand new Limit Breaks, more powerful Locks, and a brand-new alternate win condition to strike fear into every opponent! Check out the set today! Set 14: Brilliant Strike now available! After a slight holiday delay, Brilliant Strike is now available! With new cards for multiple clans, including great Crossrides and Reverses, this is a must to take your deck to the next level! Get some today! Divine Dragon Progression now available! Kagero takes center stage with this new Extra Booster! The best reprints, new techs, and the simply insane Grade 4 make this the set to have! Available today! Champions of the Cosmos now available! Nova Grappler is back with this excellent Extra booster! With multiple re-Standing Vanguards, and an amazing Crossride that gives all of your Rearguards a second chance to attack, this set brings the best of Nova forward for everyone to easily collect and enjoy! Successor of the Sacred Regalia launches! Genesis returns with this excellent deck! A Ride Break along with interesting new ways to add Soul on your opponent's turn leads to lots of late-game surprises! now available! English Booster 11: Seal Dragons Unleashed launches! Set 11 now available in English! Jump ahead with this powerful set! Set 13: Catastrophic Outbreak launches! After a bit of a delay, Catastrophic Outbreak lands in the West! With amazing new Lock abilities, the dark 'Reverse' units appear in multiple Clans! A total game-changer, this set is available now from your local participating retailer! Mystic Magus Extra Booster launches! It's all Oracle all the Time with this bold new Extra Booster! Power up your Oracle build, or put together an amazing new deck right out of the box! Now available at retailers! Dimensional Brave Kaiser Trial Deck Now Available! Dimension Police finally gets their own Trial Deck, it is out of this world! Featuring a Ride Break that cancels Flash Shields (also called Null Guards or Perfect Guards depending on your region), no opponent is safe! Get one this weekend! Set 12: Binding Force of the Black Rings Booster Now Available! Explore the new Lock ability in a full Booster set! Powerful cards for Clans old and new, including Link Joker! Find it at your local store today! Star-vader and Revenger Trial Decks Available! New decks now available for Shadow Paladin, and the brand-new clan Link Joker! Use the new ability Lock to temporarily erase entire areas of the playfield from existence! Pick them up today! A replica of Daigo's deck from the Cardfight!! Vanguard anime is now available for purchase! It comes with a 50 card Royal Paladin deck, 2 special Daigo PR cards, and 2 special Daigo bromides (collectible photos)! Supplies are extremely limited, so pick them up today! Fighters' Collection 2013 now available at limited stores! If you are in the area, pick some up today! Booster 11: Seal Dragons Unleashed now available! Insane Ride Breaks, new tech for every Grade, tons of support for Tachikaze and other great Clans, what more could you ask for Now available! Extra Booster 06: Dazzling Divas now available! Crossrides, Ride Breaks, reprinted Flash Shields (Perfect / Null Guards) and more! It's another excellent 100% Bermuda Triangle Extra Set, and it's available right now! Booster Pack 10: Triumphant Return of the King of Knights now available! After a small translation hiccup, BP 10 is now available! All your favorite Set 1 and 2 characters return with great new abilities! Use Ride Break to crush the competition! Available now! Machine Soldier / Cherry Blossom Trial Decks Now in English! Trial Decks 3 and 4 are now available in English! Pick up the cost-effective Nova Grappler and Oracle's defensive wall of returning units today! Eradicator / Liberator Trial Decks Launch! Narukami and Gold Paladin Trial Decks for the new era! With the return of familiar allies and new powerful on-Ride abilities, both Eradicator of the Empire and Liberator of the Sanctuary are must-haves! Pick one up today! Set 9: Clash of Knights & Dragons Released! Apologies for the late news post (we were in Japan, cheering on the North American CFV National participants at Worlds), but the Set 9 translations are now available! New Crossrides, tons of new and powerful cards for many different Clans, and more! Please note that this is for the Japanese Format only. For example, you may have 1 Alfred and 1 Dragonic Overlord the End. Alternatively, you could have 2 Silent Tom. You cannot have 2 Silent Tom and 1 Godhawk, Ichibyoshi (as that is three total copies - you may have at max two). Celestial Valkyries / Infinite Phantom Legion Launch! Two great Clans get sets all their own! Oracle Thinktank and Nova Grappler both receive they very own Extra Booster sets! With reprints of hard-to-find cards and brand new additions, both sets make for an easy entry into the power hidden within these Clans! Pick up a bunch while supplies last! Cards known popularly as 'Flash Shields' or 'Perfect / Null Guards' now have the 'Sentinel' Keyword. You may have no more than 4 cards with 'Sentinel' in your Deck. For official confirmation, check the How To Play Section. Blue Storm Armada Booster Pack Launch! Aqua Force, Launch! Set 8 of the original Japanese Cardfight!! Vanguard is now available! Aqua Force, Dimenson Police, and Neo Nectar rise to take the world of Cray by storm! With tons of new tech, and the ever-attacking Aqua Force, pick some up today! Descendant of the Sea Emperor Trial Deck Launch! Ride on the High Seas! After a bit of a holdup on translations, the newest Cardfight!! Vanguard Trial Deck is available! Join the Aqua Force on their ever-more-powerful repeated attacks! Also, the first printing of this Trial Deck comes with a bevy of awesome promos - an Organized Play Promo Pack, two Great Nature promos (one of which is a Grade 4, playable until late September), and an actual Soulsaver Dragon! Pick them up while they last! Rampage of the Beast King / English Cavalry of Black Steel Launches! English and Japanese releases! The English version of Cavalry, and Japanese Set 7! New Spike Brothers and Gold Paladins for English, and Great Nature, Dark Irregulars, and Pale Moon for original Japanese players! Pick yours up today! Breaker of Limits Booster Pack Launches! Set Six releases! Swarming Gold Paladins, Battling Narukami, Damage-manipulating Angel Feather, and the new Limit Break abilities bring a major shift to the Vanguard world! Pick it up at participating retailers today! Slash of Silver Wolf / Resonance of Thunder Dragon TDs! Asia Circuit Trial Decks now available! Brand-new Gold Paladin / Narukami decks! Limit Break Abilities and more! Powerful Grade 3s, techy lower-Grade Boosting Units, and more! Banquet of Divas (Diva Festival) is now available! 35 Bermuda Triangle cards - an entire clan from one set! Available at all participating retailers! Also look for Emi, Flores, Aqua, and Pacifica cardsleeves! English Edition Onslaught of Dragon Souls Launch! English Edition Set 2 is now available! Spike Brothers, Granblue, and more! Available at all participating retailers! Set 5: Awakening of Twin Blades! Set 5 has begun to arrive at participating stores! Bran new and awesome Neo Nectar, as well as combo cards for Shadow Paladin / Royal Paladin decks! Check out these amazing new cards today! English cards are now available! Blaster Blade Trials, Dragonic Overlord Trials, and Set 1 Boosters are now available nationwide! Pick some up today! Comic Style Vol. 1 and Beginner Boxes Now Available! So much out today! Comic Style is the Extra Set with all the cards in the Cardfight!! Vanguard manga, and the Beginner sets contain a card box, deck case, sleeves, trial deck, triple-rare, promo, and 2 additional promo packs! (The card box even has a little handle!) Check all this neat stuff out at a participating retailer today! Set 4: Eclipse of the Hollow Shadow God! Set 3 has arrived at participating stores! Triggers for Megacolony, new Kagero, Nova Grappler, and Royal Paladin cards, and the brand-new clans Shadow Paladin and Dimension Police! Check out these amazing new cards today! Set 3: Invasion of the Demonic Marquis! Set 3 has arrived at participating stores! Triggers for Tachikaze and Dark Irregulars, new Royal Paladin and Oracle Thinktank cards, and the brand-new clan Pale Moon! Check out these amazing new cards today! As of Sept. 5th, you may no longer choose Barcgal as your starting Vanguard. There are no further restrictions on this card - you can still put four in your deck, and so on. For official confirmation, check the How To Play Section. Trial Deck 3 and 4 Released! They're out! Check with your local stores today, or order online from any of our approved retailers for great prices and cheap, fast shipping! Both decks have great rares from the first set of Boosters, as well as alternate art cards for a must-have card of the Nova Grappler and Oracle Thinktank clans! Trial Deck 3 and 4 Translations up! Translations are available for the brand-new Nova Grappler and Oracle Thinktank Trial Decks! They'll be available for purchase in just a few days (they are in customs right now), so stay tuned! Set 2: Onslaught of Dragon Souls! Set 2 has arrived at participating stores! With tons of cards for the major clans, as well as full Trigger sets for Granblue and Spike Brothers, this set is a game-changer! Pick up some today! Sleeves available! 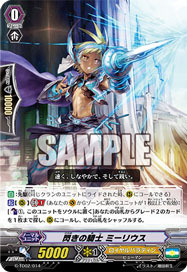 we've gotten in a number of excellent sleeves in - Vanguard logo, as well as Aichi and Misaki character sleeves! Quantities are limited, so check participating stores today! For those of you who already play, the new sets are on their way out really soon, with two new Trial Decks and a new Booster set - check Set Info for details! Heart of the Cards is open for business! We're here to bring you the best Japanese CCGs in a way that everyone in the West can play, and we are starting with the newest hit game - Cardfight!! Vanguard! Read the Introduction, then go to one of our licensed shops in the Where to Buy and pick up some cards to play with! The game just came out, so you are getting in right at the ground floor! The Blaster Blade Trial Deck is easiest to play and the most stable, and the Dragonic Overlord Trial Deck rewards high-level players with lots of tech! The cards are in Japanese, but that's not a problem - we have Card Translations, and even Cardsleeve Inserts so you can play the whole game in English!